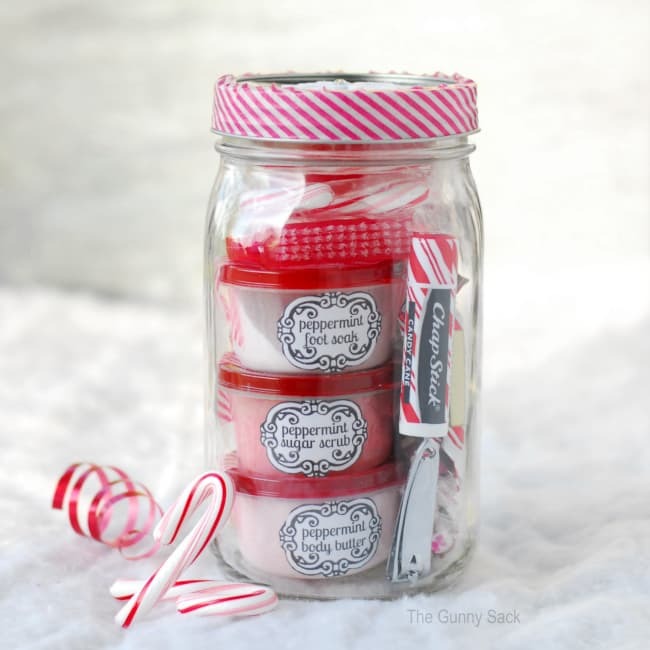 Gifts in a jar are perfect for giving homemade Christmas gifts. 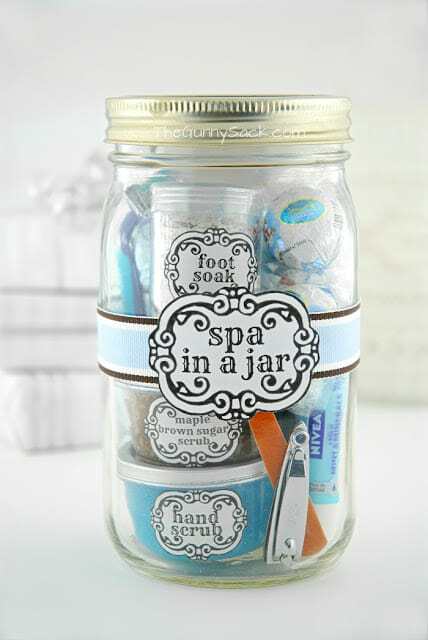 This Peppermint Pampering Jar is filled with items like body butter, foot soak and sugar scrub. The Holiday Mason Jar Extravaganza has finally arrived! Today is day one with half of the bloggers sharing their crafts. The second half of the bloggers will share tomorrow and on Friday you can share your holiday mason jars in our link party! I’ve shared many gifts in a jar for various holidays and seasons. Giving homemade Christmas gifts is so affordable! 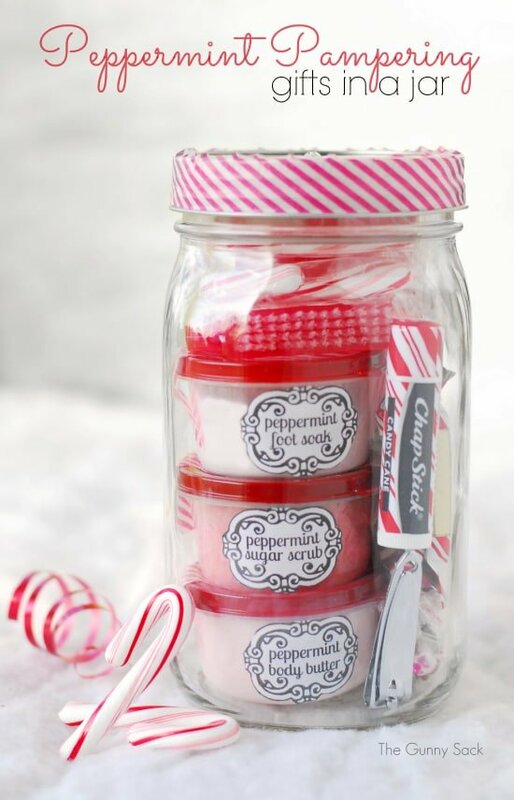 This Christmas I will be giving out gifts in a jar with a Peppermint Pampering theme. It is filled with homemade peppermint spa products and peppermint treats. If you want to make your own spa products, the recipes are below. If not, you can buy small sized bottles of similar spa products to put in the jars. Or buy large bottles and divide it into small containers. I started with lots of these small containers from the Family Dollar and spray painted the lids red. Be sure to use spray paint that is specially formulated for plastics. I used Krylon Fusion For Plastic in Pepper Red Gloss to paint these lids. 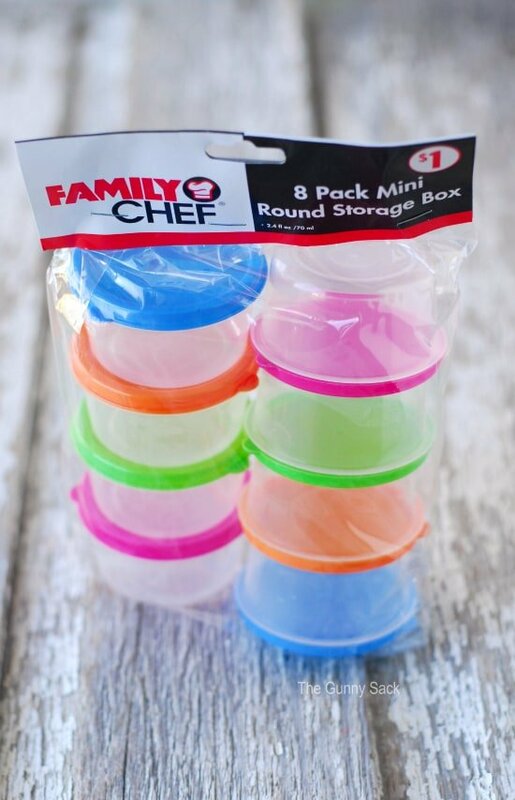 Don’t worry if you can’t find these exact containers. Try looking for small plastic containers in the bead aisle at a craft store or in the food storage aisle of a large retailer like Walmart or Target. To make the peppermint body butter, I used I used one Net Wt 7.5 oz jar of Vaseline Cocoa Butter petroleum jelly, three 8 fl. oz bottles of Bath and Body Works Twisted Peppermint body lotion (bought them on sale) and two Net Wt. 4 oz jars of Studio 35 Vitamin E cream cream. 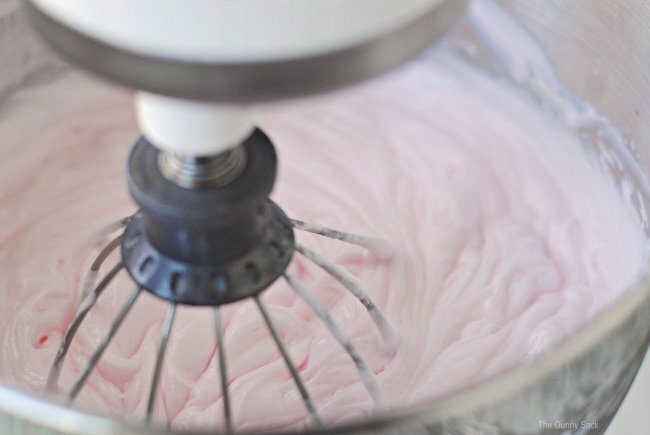 Put all of the ingredients into the mixer bowl and add 2 drops red food coloring, 5 teaspoons peppermint extract and 2 teaspoons vanilla extract. Whip everything together. Fill up as many small containers as you need and put the rest into large containers. This recipe makes 48 oz of lotion. If you don’t need that much, cut the recipe in half. 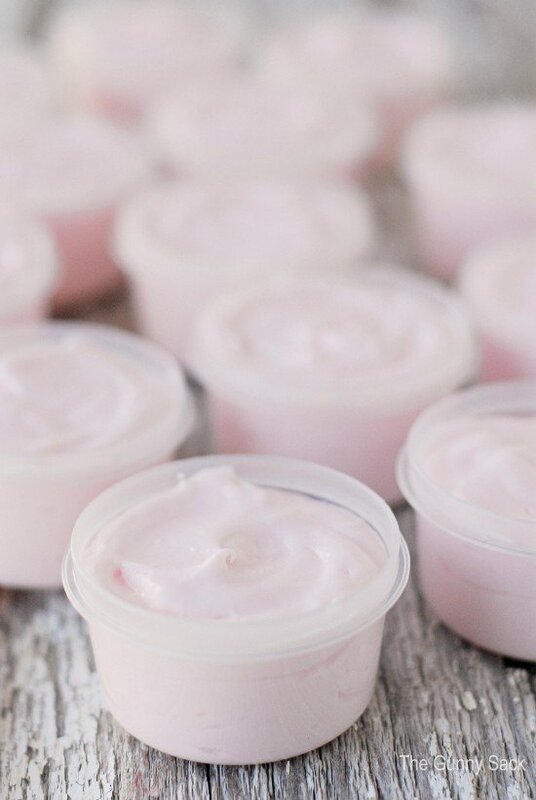 Fill containers with the body butter. This recipe makes 48 oz of lotion. 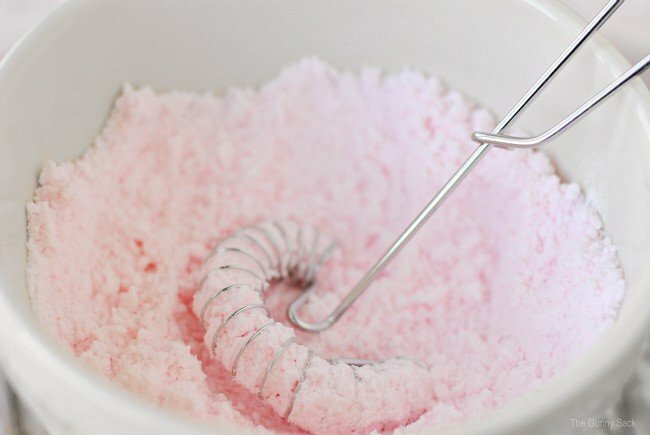 To make the peppermint sugar scrub, soften 1/2 cup of coconut oil in the microwave for 15 seconds. Add 1 1/2 cups of granulated sugar, 2-3 teaspoons peppermint extract, 1 teaspoon vanilla and 2 drops of red food coloring (if desired). Mix everything until the color is evenly distributed. 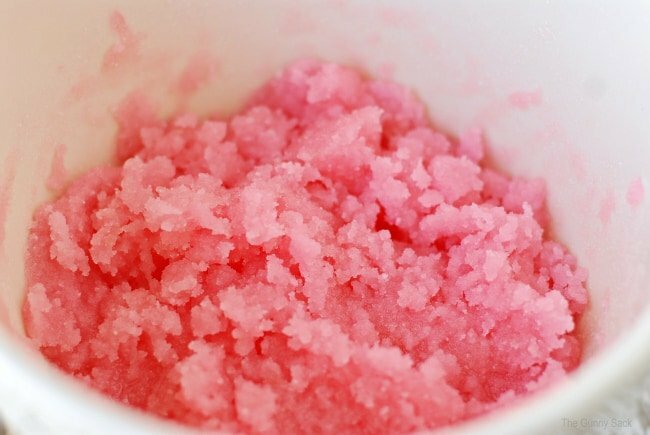 Fill containers with the sugar scrub. Put coconut oil into a bowl and soften in the microwave for 15 seconds. 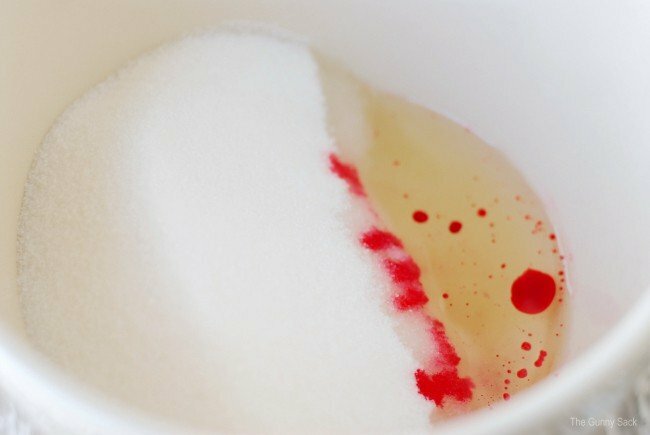 Mix in sugar, peppermint extract, vanilla extract and red food coloring. 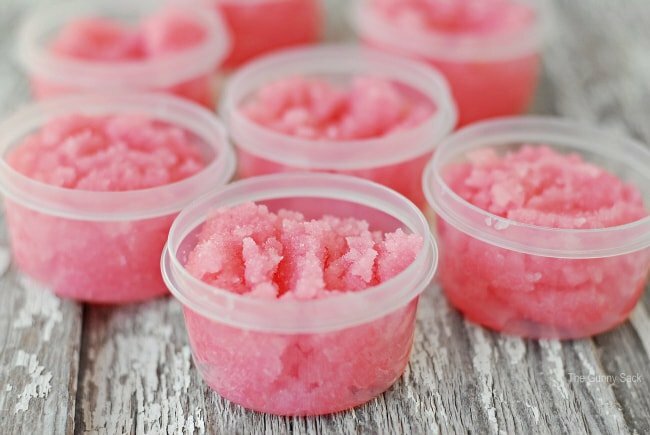 Fill containers with the sugar scrub. Recipe makes 16 oz of sugar scrub. Next, I made some peppermint foot soak by mixing together 1 cup baking soda, 1/2 cup Epsom salt, 2 teaspoons peppermint extract and 2 drops red food coloring. Use a whisk to mix well. The extract made the mix a little wet so I poured it onto a piece of parchment paper and let it dry for 1/2 an hour. Put 2 tablespoons of peppermint foot soak into each container. When ready to the foot soak, pour the entire contents of the small foot soak container into a basin of warm water. Mix together baking soda, Epsom salt, peppermint extract and red food coloring with a whisk. Allow the mixture to dry out before adding to the containers. I poured it onto a piece of parchment paper and let it dry for ½ an hour. 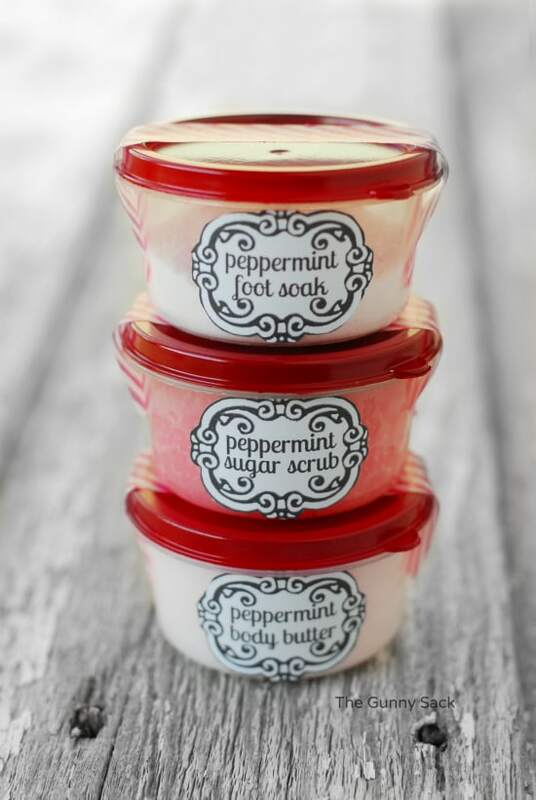 Put 2 tablespoons of peppermint foot soak into each container. Recipe makes enough that you can put 2 tablespoons into 10 containers. When ready to the foot soak, pour the entire contents of the small foot soak container into a basin of warm water. Print, cut out and glue the labels onto the containers. You can print the FREE labels below. 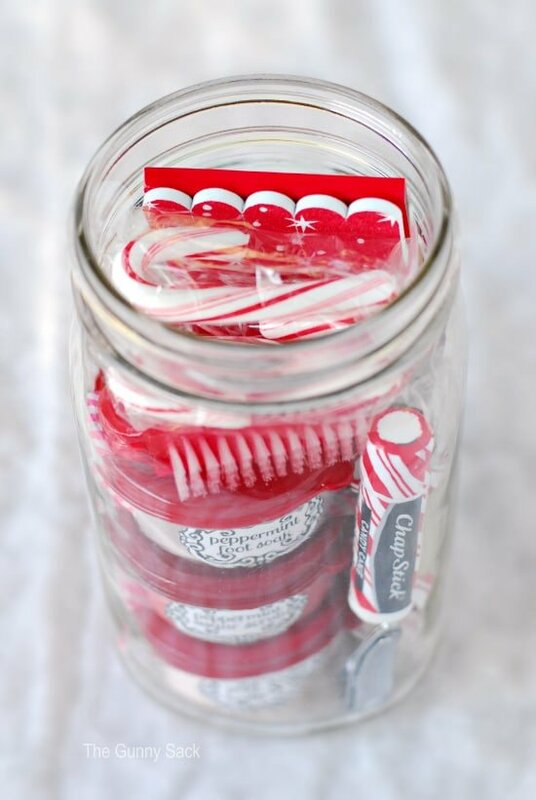 Put a piece of candy cane stripped washi tape across the top of the containers. 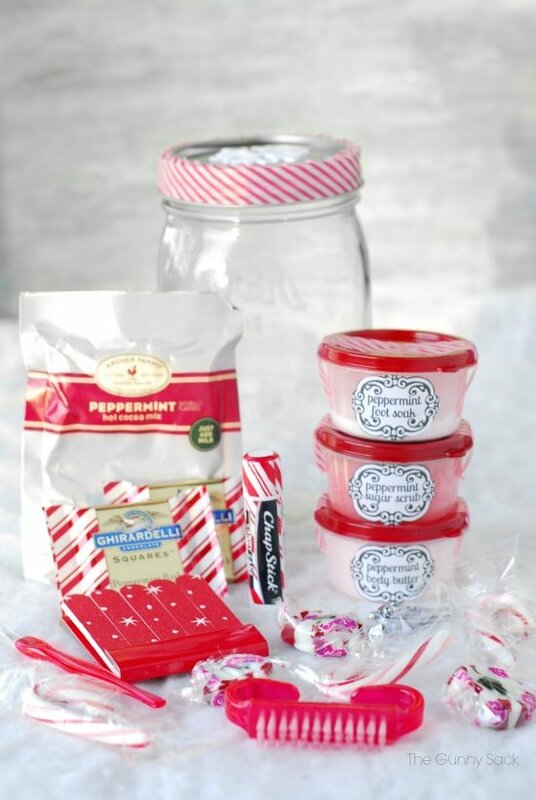 Here is everything I put into my peppermint pampering mason jar: Ghiradelli Mint Chocolate, peppermint hot cocoa packet, a red manicure set, candy cane Chapstick and peppermint candy. I used a Kerr one quart (32 oz) wide mouth mason jar. Carefully add everything to the jar so that it all fits. 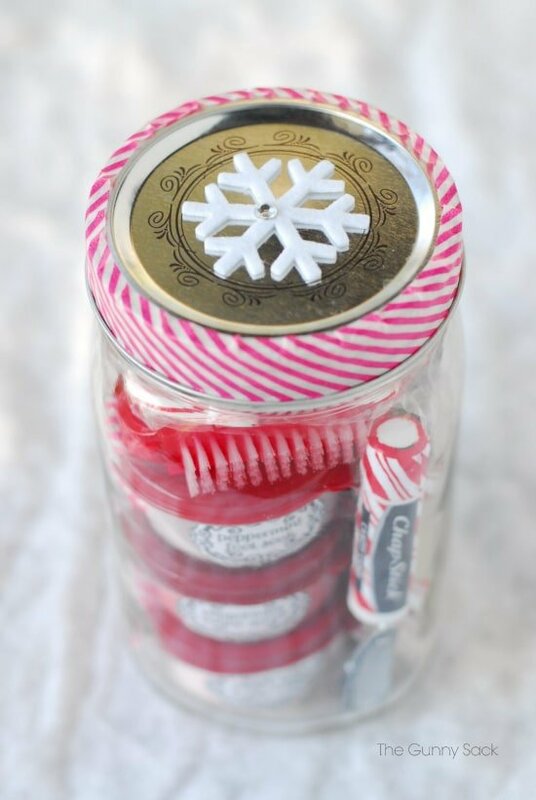 Put a piece of candy cane stripped Washi tape around the lid and add a snowflake to the top. I bought a pack of these snowflakes in the dollar section at Target. I am making a ton of these gifts in a jar to give away this Christmas! I’ve got a head start and now I just need to be sure to finish them! 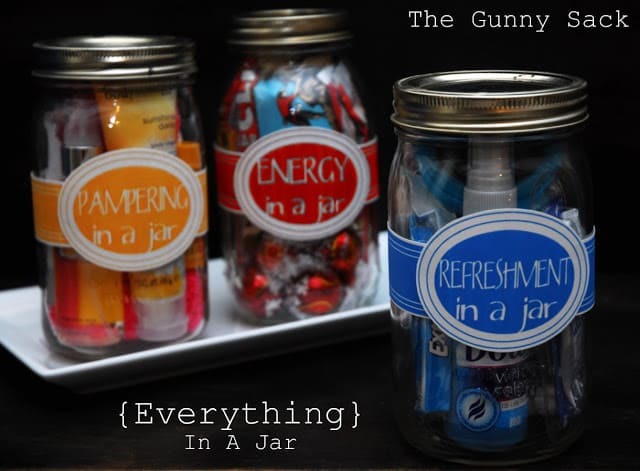 Want more gifts in a jar and mason jar craft ideas? Go visit these talented bloggers to see their holiday mason jars. Come back on Friday to share your holiday mason jar crafts in our link party. Wow, what a wonderful Idea!! I had to make 14 gifts for the girls at work. Not only was this fun to put together, your instructions were wonderful, right down to the labels!!! Thank you! You are very welcome! I’m so happy to hear that you made 14 of them! This looks like a great Christmas gift to all the girls and women in my family. 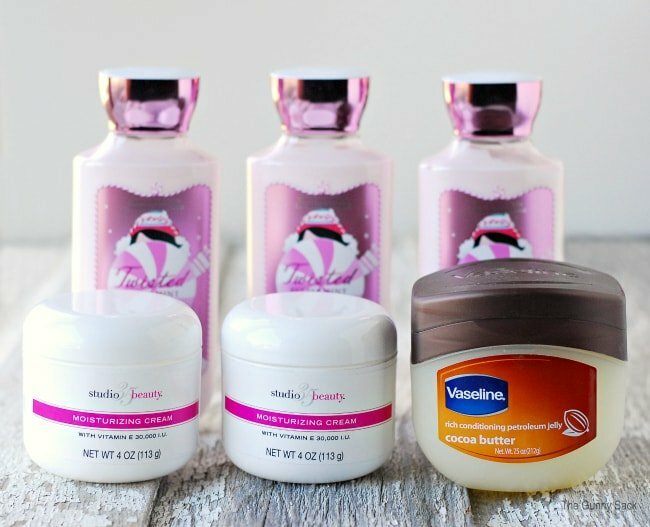 On the body butter can you substitute the petroleum jelly, peppermint body lotion and vitamin E cream with just regular cocoa butter body lotion? I’m not sure what you are asking…which ingredient did you want to substitute? The body butter has coconut oil, I have a couple girls that are allergic to coconut. And on the small containers what size are they to be able to fit 3 in the 32 oz. mason jar? If I only want to make 10 of these how much ingredients would I need? 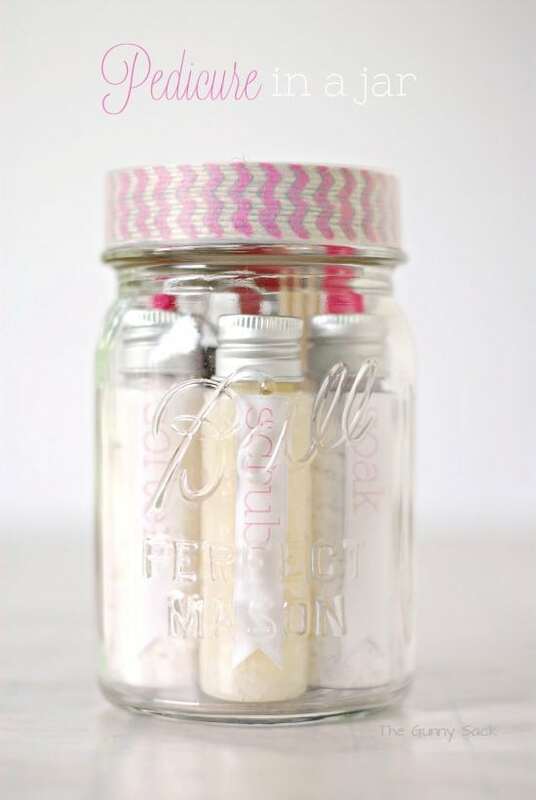 Can I just say that this is the most brilliant and easy DIY mason jar gift. Thank you so much for the idea! So cute! Followed your recipes exactly except halved the body butter recipe and it all came out perfect. Thank you for sharing! Hi! Would it be possible to make the body butter with Bath and Body Works body cream instead? I would LOVE to make this, however they aren’t coming out with the Twisted Peppermint scent in the regular lotion this year, just the body cream. Yes, you can use the body cream. Or you can use another brand peppermint lotion but the Twisted Peppermint is my FAVE cause it smells just like candy canes! I just made it last night using the B&BW body cream – I wasn’t sure if it would be too thick – but it still turned out amazing! 🙂 I’ve made a similar recipe in the past and followed it exactly, so I never thought to sub B&BW scents for the lotion!! Thanks for the great idea! Fabulous! Can’t wait to make this year’s batch! Instead of studio 35 can I use… Genes Vitamin E Creme Swiss Collagen Complex Moisturizing Creme for Dry and Sensitive …. I know in the previous comments you said any vitamin E cream but I would rather ask to double check since I didn’t see it on the list of others that you said would work. Hi, what can I use to substitute the vitamin E cream. I have searched high and low for that stuff and it is no where to be found. I tried Walgreens as you stated you purchased yours there, they have, cannot be sold online and not available at any stores within a 100 miles radius of me. Is there anything I can use instead of that? I have even looked on Amazon and they carry nothing like it. Only lotions with Vitamin E in it. HELP!!!! You can use any brand of Vitamin E Cream that you can find in your area. If you can’t find it, substitute with another creamy lotion with that is unscented or lightly scented, depending on how much money you want to spend. 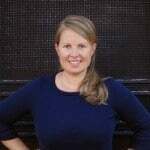 Tonia is the scrub for lips or just body ? and does the red stain ?